Briefs are an everyday, unisex choice offering both ambulatory and sedentary individuals a tailored fit in a full-coverage product. These individuals may choose Attends® Extra Absorbent Breathable Briefs when they require superior containment with the additional benefit of breathability: enhanced skin care. This may be of particular concern in cases where the user has delicate skin or reduced mobility. Contains additional super absorbent polymer and cellulose fibers for EXTRA absorbency compared to our Breathable Briefs and Value Tier Breathable Briefs. Air-comfort breathable side panels for healthy skin. 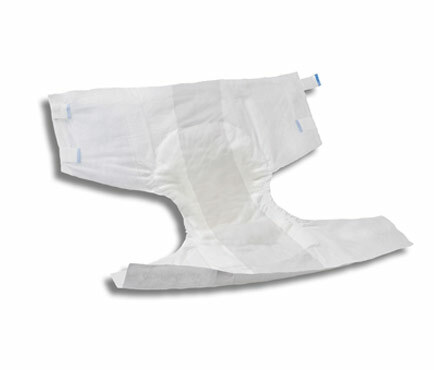 Soft, cloth-like inner liner AND outer covering for comfort, discretion and skin wellness. Triple-tier moisture locking system (pH-reducing fibers, microporous acquisition layer, super absorbent polymer) for exponential improvements in absorbency, skin health and odor control. Extra-wide, soft and flexible Comfort Flex-Tabs® fasten anywhere for precise fit and provide added security. These are a great improvement over the diapers I was buying from a large chain store. My son who is disabled has not had any leaks since using your product. He is also happy not to drag up wet sheets from his bedroom.